Saudi Arabia acknowledged Oct. 20 that Washington Post contributor Jamal Khashoggi was killed while visiting its consulate in Istanbul, saying he died during a fist fight. Claims by the government of Saudi Arabia that Washington Post contributing columnist Jamal Khashoggi died in a physical altercation inside the Saudi Consulate in Istanbul drew immediate skepticism and contradicted earlier dueling accounts from Saudi and Turkish officials. CIA officials have listened to an audio recording that Turkish officials say proves the journalist was killed and dismembered by a team of Saudi agents inside the consulate, according to people familiar with the matter. If verified, the recording would make it difficult for the White House to accept the Saudi version that Khashoggi’s death was effectively an accident. A CIA spokeswoman declined to comment. Current and former U.S. intelligence officials, foreign policy experts and lawmakers were quick to accuse the Saudi government of a whitewash. Khashoggi had gone to the Saudi Consulate on Oct. 2 to obtain documents that he needed to marry his fiancee, a Turkish citizen. There has been no indication that he was going to meet with Saudis about possibly returning to his home country. The Saudi government had previously said that Khashoggi left the consulate that day and that officials did not know where he was. Surveillance camera footage soon surfaced of Khashoggi walking into the building, but there was no footage of him leaving. The White House did not immediately accept the Saudi findings, which amounted to the first official confirmation that Khashoggi is dead. President Trump has privately expressed skepticism that the operation could have taken place without Mohammed’s knowledge, and the president has been told by a number of advisers that the Saudis would try to create a cover story that avoided blaming the crown prince, Trump’s advisers said. But Trump is also wary of overreacting to Khashoggi’s death, his aim being to avoid aggravating an international crisis and rupturing U.S.-Saudi relations. U.S. officials knew what the Saudis planned to say hours before they released their statement, a Trump adviser said. “Trump’s inclination is not to ruin the relationship,” the adviser said. White House press secretary Sarah Sanders issued a cautious statement. “The United States acknowledges the announcement from the Kingdom of Saudi Arabia that its investigation into the fate of Jamal Khashoggi is progressing and that it has taken action against the suspects it has identified thus far,” her statement said. The Saudi government announced that it had detained 18 unnamed individuals and fired five top officials. “We will continue to closely follow the international investigations into this tragic incident and advocate for justice that is timely, transparent, and in accordance with all due process. We are saddened to hear confirmation of Mr. Khashoggi’s death, and we offer our deepest condolences to his family, fiancée, and friends,” Sanders said. The Saudi government said it would take another month to complete a full investigation, which would be overseen by Mohammed. That decision also drew intense skepticism, since the crown prince has been tied to the operation that led to Khashoggi’s death, including through U.S. intelligence reports. The official Saudi account did not explain what happened to Khashoggi’s body and was not supported by any evidence. Khashoggi had recently told friends that Saudi officials close to the crown prince had tried to lure him back to the kingdom, but he said he believed that they would never guarantee his safety. U.S. intelligence had also intercepted communications of Saudi officials discussing plans to lure Khashoggi back, an effort that was personally directed by Mohammed, a frequent subject of Khashoggi’s journalistic criticism, according to people who have seen the intelligence reports. One of the two top officials whom the Saudis said had been removed from their posts, Saud al-Qahtani, a media adviser to the crown prince, had personally tried to persuade Khashoggi to return, assuring him that he would be safe and even holding out the prospect of a job working for Mohammed, according to the journalist’s friends. “He said: ‘Are you kidding? I don’t trust them one bit,’ ” said Khaled Saffuri, an Arab American political activist, recounting a conversation he had with Khashoggi the day Khashoggi received a phone call from Qahtani in May. It was not clear whether any of the Saudis that Turkish officials claim participated in the operation in Istanbul were among those whom Saudi authorities have detained. The Washington Post has reviewed the passport information and photos of 15 men who Turkish officials say were part of the team. Some of them have links to Mohammed, the day-to-day ruler of the Saudi kingdom. Five members of the team have traveled to the United States in recent years on trips that overlapped with visits by Mohammed, three more than were previously known, travel records and photographs show. The proximity of their flights to movements by Mohammed suggests that the men are members of his security entourage, experts said, potentially complicating the ability of the government to claim that the killing was carried out without Mohammed’s consent. The Post obtained pictures of the passports of seven of the 15 Saudis on Tuesday and used that information to verify that one, Khalid Aedh Alotaibi, arrived in Washington in March, three days before the crown prince. The Post on Friday obtained passport information for the remaining eight Saudis identified by Turkish officials and found that three others had also traveled to the United States on trips coinciding with travel by Saudi leaders. Mustafa Mohammed M. Almadani, 57, touched down in New York three days after the start of Mohammed’s nationwide tour, shortly before the crown prince was due in New York City. A year earlier, a similar scenario played out. In February 2017, Alotaibi and Fahad Shabib A. Albalawi, another alleged member of the team, arrived in Washington on the same day. Three weeks later, Mohammed met with Trump at the White House. Both Shabib and Albalawi left the United States in May. In 2015, Alotaibi and a fourth Saudi from the alleged team, Thaar Ghaleb T. Alharbi, arrived ahead of a summit at Camp David attended by then-Crown Prince Mohammed bin Nayef and Mohammed, then the deputy crown prince. The New York Times reported this week that photographs show a fifth man, Maher Abdulaziz M. Mutreb, with Mohammed during visits in the past year to France, Spain and the United States. Mutreb’s entry and exit records do not show any arrival or departure in the United States during the time of Mohammed’s U.S. visit. Riedel said the lack of an entry report for Mutreb could mean he used a second passport. “Many security services provide multiple passports to their officers,” he said. 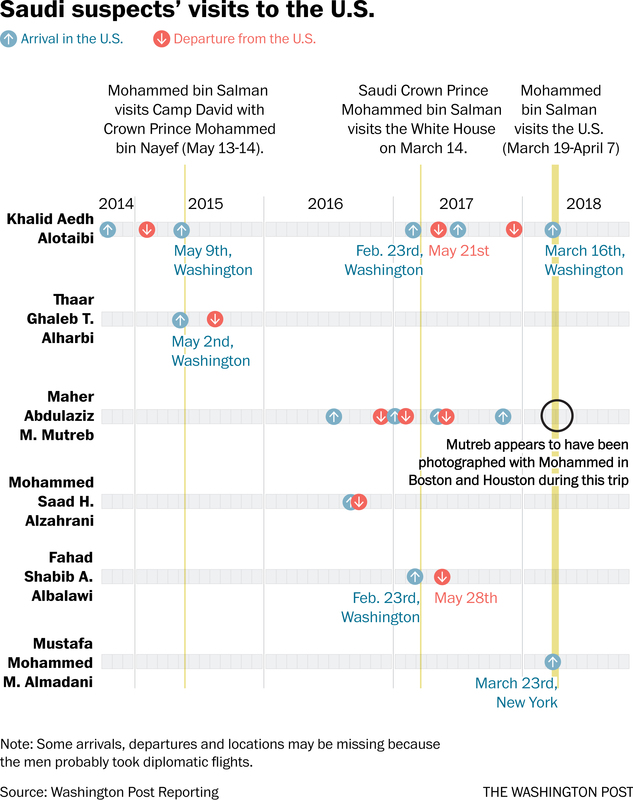 The passport records show that Mutreb visited the United States in July 2016, coinciding with a visit by Saudi Foreign Minister Adel al-Jubeir. Turkish President Recep Tayyip Erdogan will accept Saudi Arabia’s handling of the investigation, analysts predicted, given the seniority of the Saudi officials arrested. Joby Warrick, Aaron Davis, Souad Mekhennet, John Hudson, Josh Dawsey, Karoun Demirjian, Andrew Ba Tran and Julie Tate contributed to this report. Shane Harris covers intelligence and national security for the Post. He has been a writer at the Wall Street Journal, Foreign Policy, and other publications. He also has written two books, The Watchers and @War.